This is an original oil painting, which I named Parrot Still Life. This is the most recent in a series of vertical still lifes that I've done in the past few years. The one I had done previous to this one, called Still Life, was made primarily of horizontal and vertical compositional movements. For this one, I wanted a more diagonal movement, which would be superimposed over the image, and integrated with the image in some places. This is a variation of the grid format, a commonly used compositional framework in the 20th and 21st centuries - a criss-cross of diagonal lines in both directions, some on the picture plane, and some under or "through" the objects. I used this as a continuation of the process of changing from naturalistic appearances to more abstracted images; but I try to keep the process intuitive, rather than overly cerebral. 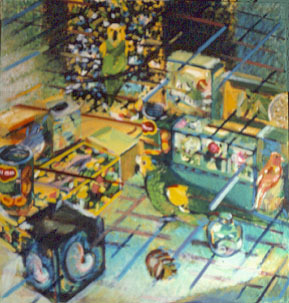 As with the other still lifes in the series, I used many commercial packages, such as tissue boxes, birdseed boxes, and cans (in this case, of peaches). I also included a small clear glass jar, and in the center foreground, a leaf I had collected from the ground when I went to see my great-great-grandfather and -grandmother's house for the first time (while doing some genealogy). Amazingly, this unusual leaf did not decay, but instead turned hard and has stayed the same as when I picked it up. As so often happens, when I was conceiving this painting (over many months), I was talking with an acquaintance, who showed me photos of their pet parrot. I've always wanted to paint a parrot, ever since I saw a couple in one of Larry Rivers' paintings 30 years ago. I mentioned this, and she gave me the photos to use. The parrot image went perfectly with this painting, which I wanted to be predominantly yellow ochre in cast, plus blue-green - but mostly earth colors, since I often use primary colors in my work, and I wanted to change that. So I put the parrot in two places, one in a "window-like," natural setting at the top of the painting, and one on the table, among the objects. All of the objects in this painting have images of natural forms on them, or are made of a natural material. In some cases, it is food - peaches, rice, citrus fruit; plus shells, birds, flowers; and the "dried" leaf and a clear glass bottle. There is also a box with an image of a tall ship on the ocean, which fit in with my ancestor leaf. Painting the peaches was particularly fun - I guess because the image itself is beautiful, but these kinds of images are seldom commemorated in art, so it's unusual to paint them. Somehow that makes them interesting to paint. I began the painting with an underlayer of semi-transparent paint, as I usually do, to block in the composition, and to have this underlayer show through the finished painting, under subsequent layers of semi-transparent color. The yellow ochre (a gold-brown) gave a warm richness to the final image. The paintings are not preconceived - I just have a general feeling about how I want the image to look. The process of painting will gradually cause the image to emerge; and stopping to study the painting often over the 2 months or so it takes to paint the image is part of the attraction of the painting process for me - to see what happens, and go with that. I use birds often in my work; as with other creatures, I see birds as intelligent. I have some myself, and I've observed their pecularities, their individuality, and their awareness. They also represent for me certain qualities that I try to express: fragility, freedom and delicacy. They are finding now that parrots in particular have a great degree of intelligence - as much as a dog. They not only "parrot" our words and sounds, they are able to understand what many of those words mean, and can add, subtract, and by touch can name many disparate materials, such as wood and plastic, and, like the primates who have been taught sign language and thus communicated with humans on very complex levels, can learn our language and "converse" using our words. I always like to have living things in my paintings - particularly animals and birds, just as I like to have them in my world.